Angelenos, take some pride in knowing that we can survive just about any disaster. Riots? Earthquakes? Wildfires? Mudslides? Ryan Seacrest? Pfft. We got it covered. And not surprisingly, according to a new Google mash-up called Ground Zero, it looks like no matter where you’d drop a nuclear bomb in Los Angeles, most of the rest of the County would survive. That’s the nice thing about urban sprawl. 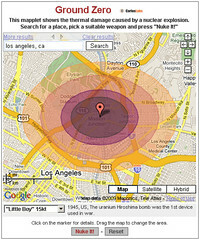 To see for yourself, click here, enter an address, then choose your bomb of choice, from Fatman to Little Boy to a more modern Chinese built warhead, and click “Nuke It!” You’ll see who dies first, and who may get off with just a little necrosis (I don’t know what that means either, but I’m betting it’s nasty). You can even see the impact of an asteroid collision, which actually might finally do us in. On the bright side, it would take Seacrest with us. It may be a little premature to claim that we have survived Seacrest. Tip: enter a zipcode for better accuracy. I think I would rather die in a nuclear blast than survive. There is a subbasement in the Google compound that is populated by some seriously morbid geeks. Strike that: it’s not the Google underground that’s twisted, it’s Carlos Labs. Great post! For anyone that grew up pre-Iron Curtain going down, this was a reality. One of my small comforts was knowing that Los Angeles was targeted with overkill capacity because of all the defense contractors – Skunk Works, Rocketdyne, Hughes, etc… So it would have generally been a quick and painless end. If one was lucky a good view of one or two detonations would be visible before being vaporized. BTW – ICBM’s still exist. We got ’em, the Russians got ’em… They’re not deactivated and in monthballs. Just because no one talks about it anymore doesn’t mean that some maniac can’t still launch ’em. With the end of the cold war, the US “detargeted” our ICBM’s, the Russians did not last I heard… and they’ve just recently finished their Doomsday launch capabilities – kind of like in Dr. Strangelove, but not as sci-fi. But don’t worry – all will be just fine. Next PostNext Medical Marijuana Patients Breathe A Little Easier!